I wanted to make this recipe anyway but then on Friday night I was driving through some inexplicably bad traffic (honestly, does no one remember 1982 when were legally granted to ability to turn RIGHT ON RED???) when suddently, I heard Michele Norris’ voice on NPR’s “All Things Considered” telling me that she is about to make this very thing WITH Dorie herself. My traffic-induced agita dissipated and I was all ears. At the end of the segment I decided I needed to make this dish that very weekend. I had a little trouble finding the right sized pumpkin, it being post-Halloween and all. The first one I brought home weighed in at 7+ lbs. The ones I saw at Whole Foods the next day were way too small. I thought about using other kinds of squash but wasn’t sure they’d have the roomy interior of the pumpkin. My solution was to buy three 1-lb. pumpkins and I made Personal Stuffed Pumpkins. You may recall that I am not a fan of prepping squash, to say the least. But these were pretty painless. The stuffing is really…stuffing. 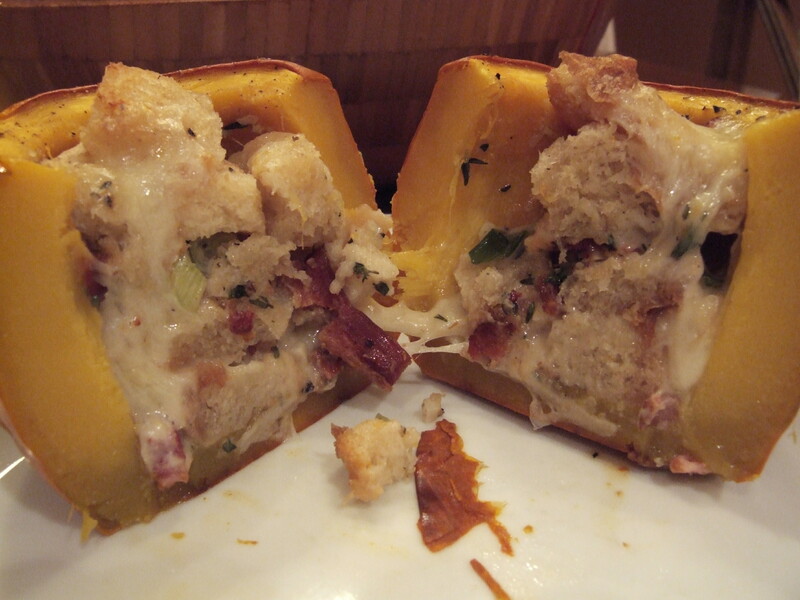 Stale bread, herbs, cheese, garlic, scallions, and bacon, all tossed together and stuffed into the cleaned out pumpkin cavity. Pour in just enough cream (enhanced with a little fresh nutmeg) to moisten, replace the caps and bake. If you’re doing one large pumpkin the cooking time is 90 minutes to 2 hours. My little ones only took one hour. 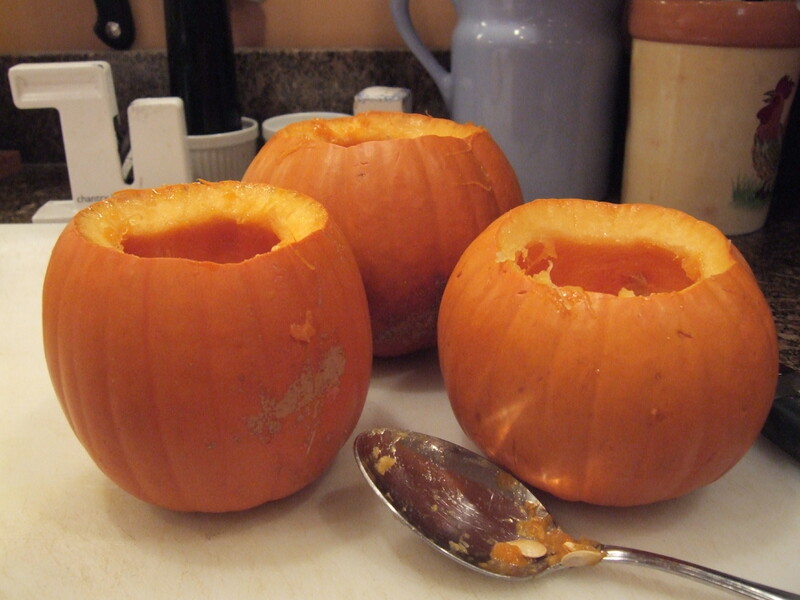 The other nice thing about making three separate pumpkins is that I could leave the bacon out of the vegetarian’s. These were absolutely delicious. Warm and cheese-y and bread-y and pumpkin-y. I served them with Pam Anderson’s beet salad and it was a delightful fall meal. Click on the NPR link above for the recipe! I did exactly the same thing – bad traffic Friday evening, Michelle and Dorie making and eating the pumpkin on All Things Considered. I couldn’t stop thinking about it. mmm mmm! I bought 5 small pumpkins at whole foods on Saturday, and a dinner meant to be at our house was easily transported to friends having issues with work at their house, keeping them home. It was portable, easy, and DEELISH! I know Tish, they are so good, so versatile, and, as you discovered, so portable! These look fabulous!!! I’m glad to hear they were tasty too. 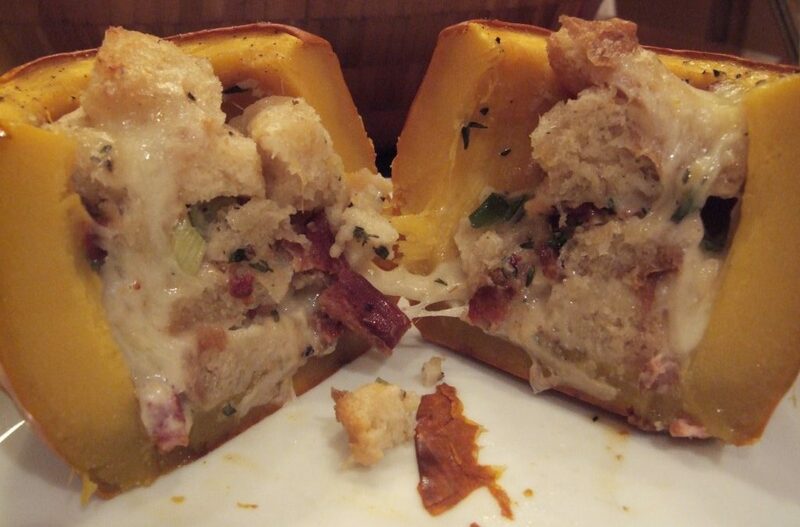 Love the photo of the cross-section…makes me want to gobble one up right now! Wow do these look good! What a great idea! 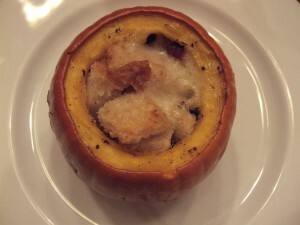 I am going to try these next this week I made the PG, it’s a winner too! How funny, I was just reading your “Summer Squash Casserole” recipe and thinking I should send you this one to complement (this is my personal “alone in a dim room with a big spoon” go-to dish)…. and then I remembered you’d reviewed the book it’s from: Around my French Table. 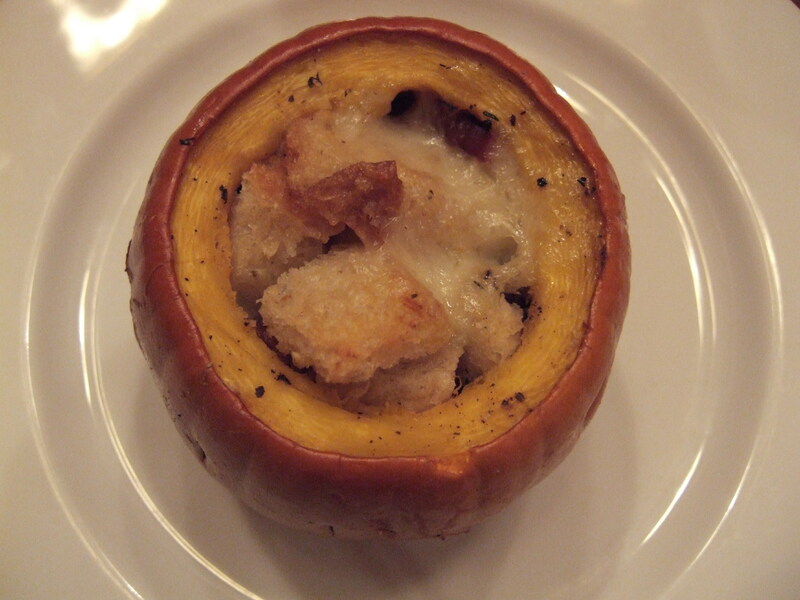 Google…voila… I see you’ve also had this cheesy pumpkiny goodness. I’m looking forward to the inevitable October 31 cold snap so I can heat the house with this dish’s roasty goodness.